Jungle Navigation Company Skipper Canteen is a table service restaurant in Adventureland at Walt Disney World's Magic Kingdom. Our readers say it's good but not great. 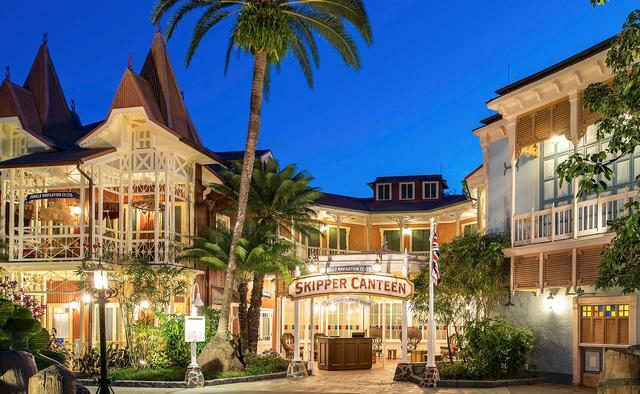 Located in the old Adventureland Veranda space, this Jungle Cruise-themed table-service restaurant offers a variety of Asian- and South American-inspired fare, and includes the first in-park references in the United States to Disney's Society of Explorers and Adventurers. The signature drink is the "Schweitzer Slush" - "frozen apple juice and passion fruit topped with Bursting Green Apple Boba Balls, first concocted by the noted explorer Dr. Albert Slush." It's $5.50, or $14.50 when served in the Jungle Skipper Canteen souvenir mug.